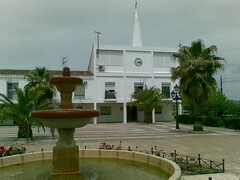 Ayuntamiento. A small meeting room to sleep in is on the second floor where the washed clothes are hanged outside. The 3rd floor is the library, where I am posting this from the free internet (also open wireless lan connection).